What is a society without its poets? If all poetry disappeared from our libraries and shelves and virtual depositories tomorrow, would it make much difference to us? If we were forbidden to write poetry would there be a revolution? What if a referendum was held tomorrow and poetry was voted out of existence by a democratic majority? What is poetry anyway (and surely the poets should not be trusted with its future)? Why doesn’t poetry touch me? Why does poetry baffle and intimidate me? The Hatred of Poetry (2016) by Ben Lerner. 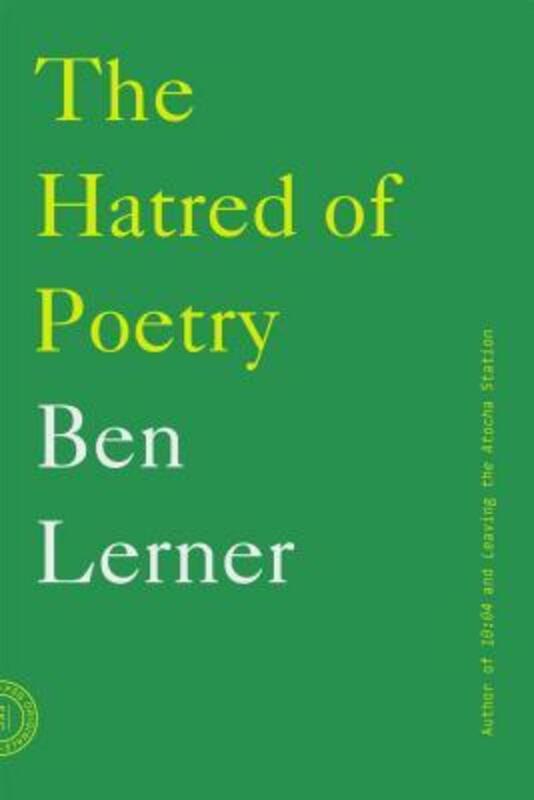 International best selling novelist, poet, critic and Professor of English at Brooklyn College, Ben Lerner, has written a witty and engaging eighty-page essay on The Hatred of Poetry (2016) (published in Australia by Text as a handsomely designed pocket book), resurrecting a debate over poetry that has never died. After the death of God and the death of the author, the death of poetry is a favourite announcement and excuse for outrage and jokes among academics, literary critics, readers, poets, and people who care about the arts. Beware the Prime Minister who offers a literary prize and omits the poets. Ben Lerner is acutely aware of these contradictions, and attempts to explain them in his long essay that turns out not to be so much about the hatred of poetry, as about disappointment and what Marianne Moore called “contempt” for poetry. On the blurb at the back of this little book his essay is presented as a defence of poetry, in a long tradition of defences of poetry since Plato’s banishment of the poet as a dangerous liar. It’s something more subtle and paradoxical than a defence. Lerner’s essay is personal as well as a public polemic. He writes that, “like so many poets I live in the space between what I am moved to do and what I can do”. Moved to write poems, he bitterly knows by how far each poem fails in its ambition. Under the force of this personal experience and the influence of his mentor Allen Grossman he constructs an elegant argument to explain why poetry will always be a necessary disappointment, especially to those who most want it to succeed in being a universal art. His argument is that “poetry” denotes an impossible demand. The fatal problem of poetry is poems. No poem lives up to the ambitions poetry has set for itself. No poem can ever live up to these ambitions. Lerner takes us towards what he means through a detailed exposition of the poetic and human failings of William Topaz McGonagall’s famously awful poem on the tragic 1879 collapse of the Tay Bridge in the city of Dundee. Lerner is adept at pinpointing each abysmal failure of technique, judgement and feeling in the poem; and by this he shows us that we have somewhere in us a set of implied benchmarks by which all poems are measured. What are they, exactly? They can be more or less spelled out in generalities, but can they be found in actual poems? Lerner says not. I would have liked to see him take up at this stage of the essay, say, Alfred Lord Tennyson’s poem of grief, Break, Break, Break in detail, and show by how little it misses its ambition. As a poet Lerner might have been able to give us an exquisite appreciation of the poem that is a near-miss. The shadow of Walt Whitman (1819-1892) lies over this essay, and perhaps his shadow still lies over American poetry because Whitman’s claims and ambitions were so large, so insistent, and so demanding of a response. Whitman of all poets anywhere near the modern age is the one who dared to be explicitly universal, and often embarrassingly universal (“I am the poet of the slaves, and of the masters of the slaves”). He serves as a foil to some of the contemporary poets Lerner introduces to the general reader, among them Claudia Rankine. Rankine writes poetry she calls lyric, the most personal form of poetry, even if it is now the most common form. But pointedly she calls her poetry “American lyric”, offering it as somehow exemplary, and if not universal then possibly national. The two long prose poems quoted in the text of the essay are stunningly personal, specific to the problems of an individual in a depersonalised world, and to a black individual where white is the norm. It is here that Lerner finally opens up to the reader about the kind of poetry he admires (and thus aspires to?). He does not go on to show how these poems fail as universal “poetry”, for it would be, as he points out, a morally bereft exercise to claim that these poems fail because they don’t speak to the experiences of white male readers. Rankine’s poems are not universal but they are powerful, I expect for almost any reader. They are not timeless but specific to how it feels to live in these times, and that is compelling for a reader. They are not asking for white readers, or white male readers for that matter, to identify with their voice but they do ask any reader who comes upon them to listen with an open heart. Rankine’s words are plain, unadorned, and lyric only because behind them there is a felt yearning. They work as examples, but they are so inimitably themselves that I am not sure what they are examples of. These poems do say, without debilitating self-consciousness, without coyness or decorative sentimentality (more benchmarks! ): What I do is me; for this I came. Next : FactCheck Q&A: what has the Children’s eSafety Commissioner done in its first year to tackle cyberbullying?